Back in 2009 I wrote a post entitled "Why Can't MSNBC.com Fix Their Online Video Offering?" where I pointed out just how bad MSNBC.com's video player was and the problems users were experiencing. Two years later, their website is still routinely having the same problems with the player not loading, videos completely freezing, missing ads, poor encoding and they still have one of the worst designed players on the market today. Every day I use CNN.com, FOXNEWS.com and MSNBC.com to not only get my news, but also review and compare the differences in the sites. 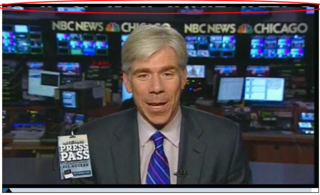 For weeks now, MSNBC.com's video player, which is an annoying pop-up window, will only load half the time. As you can see above, the window loads, but with no player or ad. This is common for the site. Next up, if the player does load and the ad starts to play, many of the ads freeze half way through. They just stop playing 15 seconds in and you have to close out the window and start all over again. If the ad does play all the way through, many times the video itself will never start and just sits at "your video is loading". If you are able to play a video, many times the video has been poorly encoded. While it's hard to tell from this screenshot, (I've circled the problem in red, click on the image to see) MSNBC.com's quality control is pretty poor. Many of the videos have jumpiness in them not from the streaming, but from the original source file they encoded and it wasn't corrected during the encoding. That can happen in the encoding process, but MSNBC.com isn't doing a good job in noticing it before it goes on the website as I routinely see videos that would never have passed quality control at other news sites. That brings me to MSNBC.com's video player. The design and functionality of their player is one of the worst on the web, hands-down. Basic things like pointing your mouse over a video in the playlist brings up a description window that covers up the current video you are watching. It's one of the worst experiences you could have when the video you want to watch is covered up by something else. But it doesn't stop there. If you like the video you are watching and want to email it to a friend, the email link does not work with certain platforms and email clients. For instance, using Outlook or Eudora on the Mac and clicking on the email link will bring up a window in the email client that says "couldn't figure out that URL". That by itself is bad enough, but it also crashes the email client in Eudora requiring you to force quit the application and restart it. This has been happening since 2007. MSNBC.com has not been able to correct this in four years.I don't get any of these same issues on CNN.com or FOXNEWS.com. I can email any story I want with my current OS/email client, the videos play quickly, there is no freezing and their players are well designed. Last year, MSNBC.com was porting their poor quality video over to the Xbox platform, which was an insult to the capabilities that the Xbox platform has in delivering good quality video. So apparently MSNBC is all about extending their crappy video experience to other Microsoft platforms as well, which someone at Xbox should keep them from doing. MSNBC.com should not be allowed to infect other Microsoft platforms like the Xbox that actually care about their users and work hard to provide a good video experience. 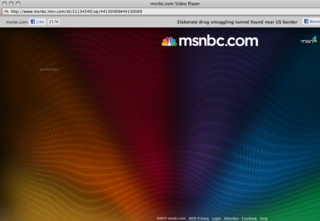 Clearly MSNBC.com could care less about these video problems. Their offering has been broken for years, not once have they even said what the problems are, when they would be fixed or even reached out to respond to my posts about the poor video experience they offer. They don't have any desire to want to improve the experience, educate the market on why these problems exists, or seem to notice all the other people who complain about the same kind of user experience in the comments section of my posts. If you are looking for a online video news source, don't use MSNBC.com unless you like wasting your time, getting frustrated, possibly having your email client crash, freezing your browser and not being able to see the video you were actually looking for. My suggestion to MSNBC.com, get out of the online video business. You're offering is an insult to the online video industry. 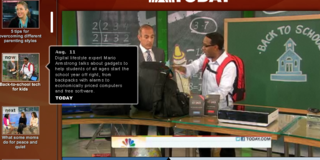 – February 2010: Why Is MSNBC Porting Poor Quality Internet Video To The Xbox? – Febuary 2009: Why Can't MSNBC.com Fix Their Online Video Offering?